It’s an increasingly widespread problem: ‘blue’ children born to ‘red’ parents. But is there anything that can be done to treat early onset political disorders—before they harden into life-long voting patterns? Some scientists say that innovative laser surgery may be the answer, and that putting politically disturbed children under the knife is far more effective than treating them on the couch. BALTIMORE -- It's one of the first questions new parents hear these days: is your child liberal or conservative? But for a growing number of parents, the answer is an all too unpleasant admission. Call them red parents of blue children, or simply red-faced with shame, these conservative mothers and fathers are hungry for a solution. Now, for the first time, scientists may finally be getting a handle on what causes political disorders in young children—and what can be done to cure this damaging affliction. Researchers believe that our political views are genetically hard-wired into the brain before birth. So why are some children capable of advanced conservative reasoning while others are afflicted with Early Onset Political Disorder or EOPD? Scientists believe that this particular variety of political disorder results when a mutation causes the product of a single gene to be altered or missing. 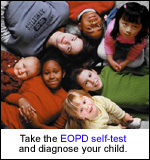 And unless the mutation is repaired at the cellular level prior to birth, EOPD can result. Download the EOPD selft-test (PDF). But thanks to an innovative surgical procedure, a solution to the disorder may finally lay within reach. Using a technique similar to arthroscopic surgery, Geiger and others have been able to penetrate the pre-frontal cortex of the brain, the neural region where reason, emotion and judgment intersect. And best of all, once made, the procedure seems to be permanent, although Geiger notes that young patients may require a dose of treatment once they turn 18. I'm sorry maybe I just don't fully understand what this is all about but from my point of view. It's just who you are. You are the way God made you and if you like to share (as do I) then what's the big deal? Just be happy with who you are, because you can't be happy with anything or anyone else until you can learn to accept yourself for who you are, and not who you and everyone else may think you should be. I totally agree Mr B I jsut canät wait to get my hands on this! Finally I will be able to convert my husband and make myself even more republic! Praise the lord! WOW! and to think all this time, to be a "red" club member, all that was needed was a lobotomy. Where do i sign up? I used to think everyone who cared about anything but their own wellbeing was a traitor to everything AMERICAN. Now, I'm willing to accept that a laser barrage that vaporizes altruistic impulses may be a viable option. This is amazing research! I cannot wait to have the procedure performed on my children, even myself! At last there's hope! I am looking forward to a life of emotional independance. I'm sick to death of sharing and tired of listening to people with opinions other than my own. Private Social Security Accounts Popular with Wealthy, Golfers According to the liberal media, President Bush’s plan for private Social Security accounts is sinking like a stone. But when conservative blogger Deanna Swift took a recent trip to Florida, she uncovered a very different story. “Everyone I met was enthusiastic about the president’s plan,” says Swift, editor of the Swift Report, a popular conservative weblog. FBI to Outsource Agents to India, China Under pressure to produce more actionable intelligence, the Federal Bureau of Investigation has announced that it plans to layoff many of its agents and outsource their positions to countries including India, China and Vietnam. The move will enable the FBI to hire three times as many agents at a fraction of the wage that they would earn in the US.